Explore the beautiful sea cliffs and sea caves. Paddle through the La Jolla Ecological Reserve filled with marine life. 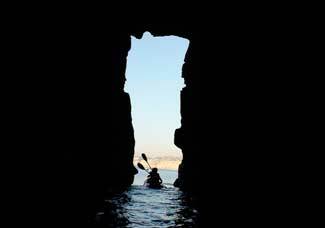 Kayak to Sunny Jim's Cave, the Arch Cave, the Clams' Cave and other sea caves for an amazing close-up of the sandstone formations. Witness sea lions, garibaldi, leopard sharks, shovelnose guitarfish and the occasional dolphin on this La Jolla kayak tour. Fun for ages 6 & up! No Experience Neccessary! Make your next trip to San Diego especially memorable with our Kayak Tours to La Jolla's 7 Caves! Explore the beautiful sea cliffs and sea caves of La Jolla by paddling a kayak! Paddle amidst the La Jolla Ecological Reserve filled with marine life including California sea lions, harbor seals, harmless leopard sharks, the California Garibaldi, Shovelnose Guitarfish and the occasional dolphin. You'll get in the water right off the beach for an exciting launch through the surf before heading over to the La Jolla caves. Kayak to Sunny Jim's cave, the Arch Cave, the Clams' Cave and other sea caves for an amazing close-up of these sandstone formations. Water conditions permitting, you'll kayak inside the Clam's Cave off Goldfish Point for a thrilling experience! Then, paddle past La Jolla Cove into the Kelp Forest along La Jolla's Ecological Reserve. Get a brief kayak surfing lesson from your guide for a thrilling return through the surf!! New! Triple Kayaks (Fits 3) Max Weight 450 lbs. Lockers and changing rooms are available; however, we recommend all participants check-in dressed accordingly for the beach, and prepared to get wet. © 2003-2017 Bike & Kayak Tours Inc. All rights reserved.